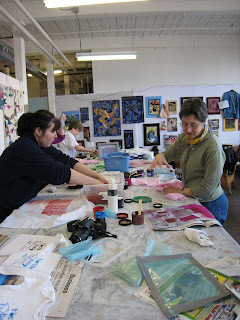 This past weekend I attended a workshop on screen printing taught by the talented Linda B. Dunn at her very cool studio in Lowell. 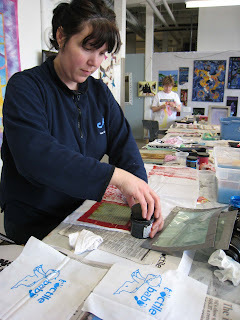 I had very little knowledge of screen printing and did not know what to expect at all... and it was FUN. It helped that Linda is such a great teacher. 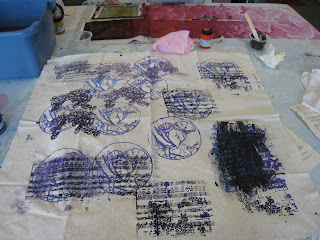 We made screens of images we brought, slapped on some fabric paint and got messy. What's not to love? As you can see, Chris was a natural. Colleen made some sweet little prints of her logo. Linda, Chris, Colleen and Nicole. How cool is that space?! Also, if you have never been up to the Western Studios in Lowell, you really should. There are 180 artists in this huge converted factory which is quite a sight to behold! 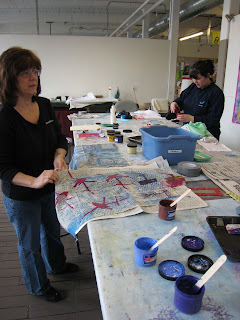 Creativity and color abound! I so hope Linda gives this workshop again! 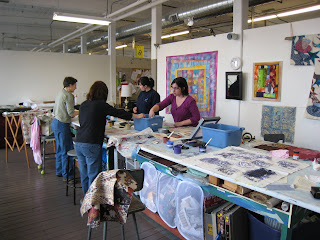 Looks like you all had a blast and what awesome studio space!